Each week, we turn our focus to praying for a specific person or group of people. If you missed the original post on effective prayer, read it here. Effective prayer is a learned habit requiring discipline and diligence. To that end, I am encouraging you to write down the people you are praying for. Part of building and maintaining habits is to have reminders and tracking tools. Making a list isn’t self-righteous or sacreligious. It is a tool. We devote time to counting calories, monitoring money, checking Facebook, making to-do lists–is prayer of lesser importance? For other posts regarding prayer, click on “prayer” in the categories tab. 6 years ago, I got a phone call from a friend and brother in Christ. What he told me absolutely shocked me: one of the members of our church had been killed in Iraq—on Memorial Day. His convoy had been hit by an IED. He was due to be home and retired in just a couple weeks. Without warning, he was gone. We raced over to the coast to be with his family. My heart grieved for them. His wife, one of the most joyful and radiant people I know, was sobbing, heartbroken. Through tears she told us about how he had gone over there to help rebuild. They’d had plans to celebrate his retirement upon his return. Now, suddenly and unexpectedly, he was gone. He also left behind three young adult children. They too, were in shock and grief. No words of comfort and no amount of hugs could ever fill the chasm so violently created in their lives. He died serving. Now he is safe in the arms of Jesus where no IED, no evil fanatic and no other pain can touch him. We draw comfort from the knowledge that he is with the Lord. His sacrifice brings into sharp perspective the immensity of Christ’s sacrifice. My friend and brother in Christ along with millions of other Americans have died to preserve our freedom, and to secure freedom for others enslaved by cruelty, oppression and tyranny. Jesus Christ, the Son of God allowed Himself to be tortured and killed in a very cruel and violent way. He didn’t have to die. He could have chosen to walk away. But He did not. He died to secure our freedom from eternal death. He died so that we might live. Every week, we observe His death when we take the Lord’s Supper. We remember. Today, millions of Americans are remembering the people who died serving our country. But what of the loved ones left behind? They have lost someone very important to them. They have sacrificed as well. My friends have grown even closer together in the wake of their loss. They are there for one another. They have drawn comfort from the Lord. Today, they remembered his death. 6 years to the day. They have picked up and continued to live. They honor his memory every day as they live full, godly lives. They are amazing people. In your prayers this week, please pray for those, like my dear friends, who have lost family and friends serving the country. I think sometimes the families are forgotten, but they should not be. They live with their sacrifice. Pray for the Lord to give them comfort in the way that only He can. Pray that He will renew their strength so that they can keep on going. Pray that they will turn to God in their times of deep grieving and sorrow. 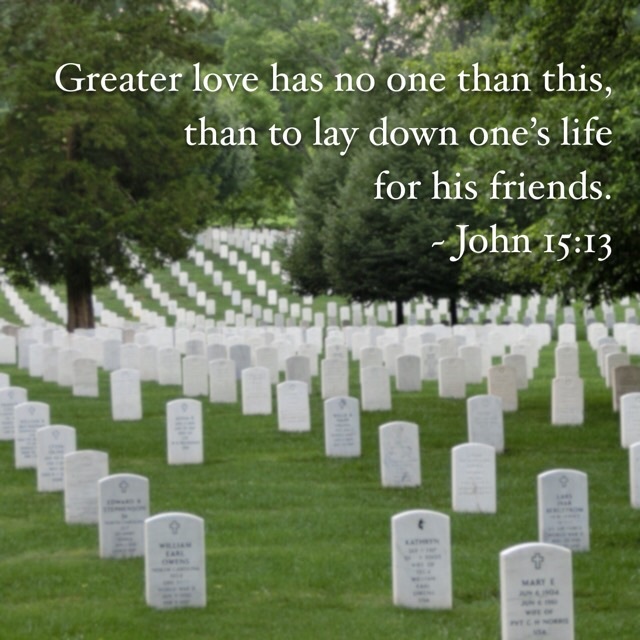 Lastly, offer thanks to God for brave men and women who are willing to serve others to the end. What would the world be like without people like them? The effective prayer of a righteous person avails much. Let us pray together to great effect this week. In loving memory of Duane G. Wolfe.